SEOUL, Nov. 29 (Yonhap) -- The leaders of South Korea and Japan agreed Wednesday to seek additional U.N. sanctions against North Korea, saying they can no longer tolerate North Korean provocations. The agreement came in a telephone conversation held hours after the communist state staged its latest missile test, breaking a 75-day hiatus in provocations. In their 20-minute phone call "President Moon Jae-in and Prime Minister Shinzo Abe agreed to further intensify their countries' cooperation to put stronger pressure and sanctions against North Korea, noting they can no longer tolerate North Korea's threats to security," Moon's chief press secretary Yoon Young-chan said in a press briefing. Wednesday's missile launch marked the 11th missile provocation staged by the North since the new South Korean leader came into office in May. Pyongyang earlier claimed complete success in its latest missile test, also declaring the completion of building what it called the "state nuclear force." The latest missile test followed the North's sixth and most powerful nuclear test so far, staged on Sept. 3. "Expressing concerns over North Korea's claim that its nuclear and missile development programs are in their final stages, the two leaders agreed to seek stronger pressure against North Korea at the U.N. Security Council meeting scheduled for Nov. 30," the Cheong Wa Dae official said. 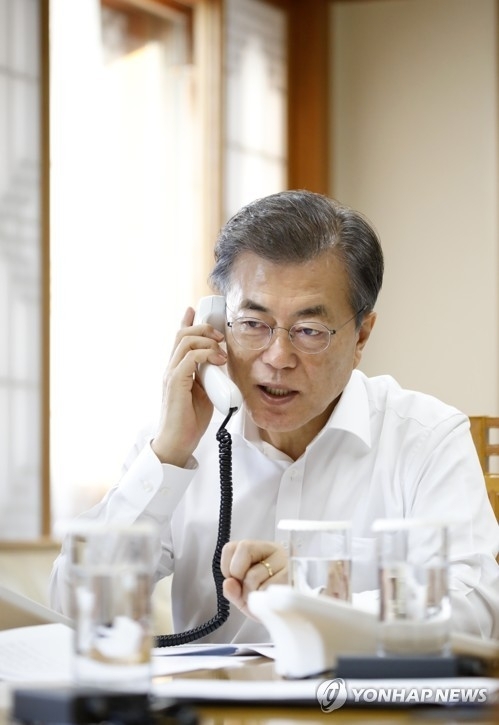 The Moon-Abe conversation followed an earlier call between the South Korean president and his U.S. counterpart Donald Trump, in which the leaders strongly condemned the North Korean missile launch as a grave challenge to global peace. Moon said he also planned to ask his Chinese counterpart, Xi Jinping, to play a more active role in preventing North Korean provocations when he visits China next month. "Prime Minister Abe emphasized that it was important for China to play a greater role in putting pressure on North Korea," Yoon said. The South Korean president expressed hope to hold a three-way summit with Abe and Xi in Tokyo at an early date. The meeting, if held, will mark a resumption of the annual summit last held in Seoul in November 2015. Moon also invited the Japanese prime minister to visit South Korea during the PyeongChang Winter Olympic Games in February. Abe said he will see if a trip will be possible, noting a parliamentary session scheduled during the period, according to Yoon.